Using the database from SeasonalFoodGuide.org, Bob and I created this March Seasonal Eating Food List of vegetables for the Mid-Atlantic region (agricultural zones 6 and 7) of the United States. This guide helps the seasonal cook to easily know how to prepare meals with the freshest ingredients that also have the lowest carbon footprint. There’s a downloadable meal planner in the Seasonal Living Resource Library. Make sure to use the signup form below to gain instant access to all the FREEBIES to help you live your seasonal life! Save me to Pinterest! Thanks! I created a useful meal planner and it is available as a free download in the Seasonal Living Resource Library. It is designed to ensure that you eat at least one seasonal meal each week, with lots of space to take notes and add recipes. Simply complete the form at the bottom of the post for instant access. Wild greens are the highlight of the March Seasonal Eating Food List. I’m talking nettles, lambs quarters, and dandelion greens! While you will find these highly nutritious cooking greens at the farmers market, they are easily foraged in most yards. You simply need to know that the places you harvest are not sprayed with herbicides, pesticides, or synthetic fertilizers. Make sure your food is clean and safe. Over the years, Stony Ridge Farm has hosted numerous herbalists who walked the property and helped me and Bob and our friends learn how to identify, harvest and prepare wild edibles. Let me share what I now know about nettles, lambs quaters, and dandelion greens to help you be a more informed shopper at the farmers’ market or a better forager in your own yard. The easiest way to enjoy nettle is in a tea. Its rich green flavor is very satisfying. I often add a bit of mint to mellow it out, especially if the nettles is dried. A spring meal can be built around nettle pesto. This is a very nice recipe with a more detailed description of stinging nettles. Enjoy! Lambs Quarters really do taste like spinach, and so it makes them fine on their own as a side dish for any spring meal. Here is a nice recipe with a full profile of this wild edible. Enjoy! March is the beginning of the green avalanche in your farm share and at the farmers’ market. Most of us begin to crave these greens come March and are burnt out and overwhelmed by the come June. Make sure to get the most of this season’s produce by selecting, storing and cooking them appropriately. These are the greens you do not need to cook to enjoy. Salad greens available in your March Seasonal Eating Food List include spinach, endive, arugula, kale, pea shoots and spouts as well as the dandelion green mentioned above. I recommend purchasing the best olive oil your money can buy. If you can taste it before purchasing all the better because you can choose a variety with a flavor profile from nutty to peppery that suits your taste. A good vinegar is a great investment this time of year, a decent balsamic is my recommendation. I also make fruit flavored vinegars from my kombucha, but that’s information for a future post. I recommend buying all these salad greens and mix them together to make a meal that has robust flavors and diverse textures. Goat cheese is a nice seasonal addition to these tossed salads. Mmmm…. Obviously, these are the spring greens that require some time on your cooktop to get the most from their flavor and often from their nutrition. For example, did you know that the nutrients in your spinach are more bioavailable when cooked? Yup! You should teach yourself how to braise vegetables if you do not already know how. Use the basic recipe to easily teach yourself. After cooking twice, it will be second nature! I braise huge pots full of collards in the spring and freeze them in half-pound portions to meet my late-summer cravings. It’s well worth your time, I promise! Here’s your March Seasonal Reading List celebrating the Irish through Modern Literature. It has my Irish Soda Bread Recipe, too! 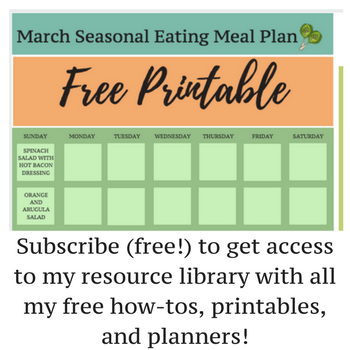 In the Seasonal Living Resource Library, I have a whole slew of meal plans, including the one I created for this March Seasonal Eating Food List. This time of year, when gardens are dormant, the January and February meal plans are just as useful in March. There’s a lot of overlap in seasonal food lists’ the first three months of the year. Sign up using the form below to download the meal plans for FREE and look around at the other downloads and printables while you are there.